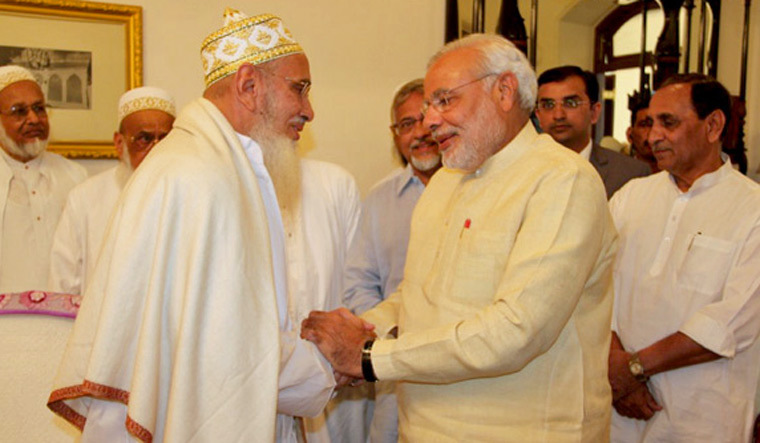 Prime Minister Narendra Modi today visited the religious head of Dawoodi Bohra community, Syedna Mufaddal Saifuddin, at Indore's Saifee mosque and addressed their nine-day religious discourse. Madhya Pradesh Chief Minister Shivraj Singh Chouhan wwas present on the occasion which is touted to be the first to be attended by any prime minister. Dawoodi Bohras community is a sect within Shia Islam. BJP has been wooing this community for last few years in a bid to reach out to minorities. The nine-days religious congregation is being attended by thousands of followers from across the country and Madhya Pradesh. The prime minister attending any event of a religious nature, organised by the Muslim community has attracted a lot of attention as this was the second major event of the muslim community which was attended by Narendra Modi after he became prime minister in 2014. Earlier in 2016, he attended the World Islamic Sufi Conference in Vigyan Bhawan, New Delhi.